While Facebook is still the top social networking platform for business, Instagram is quickly growing and now has more than one billion users. Many brands are finding ways to interact with the Instagram community and earn personally invested customers who keep coming back for more. Whether you’re a big brand or maybe just wondering how to become a successful Instagram influencer running giveaways and contests is one of the most effective ways to gain more followers, likes and comments on Instagram. The goal of your contest shouldn’t just be to increase your follower count. You want to build awareness for your brand and engage your current followers. Instagram contests are super engaging! According to a study compiled by Tailwind, Instagram contests get way more engagement than regular posts. The analysis showed that Instagram contests get 3.5 times as many likes and 64 times more comments on average than regular posts. But how you can run a successful Instagram contest? In this post, we’ll explore some of the best practices on how you can use Instagram contests to increase your followers and raise brand awareness for your business. Plus I will share with you 3 simple Instagram tips that we use here on Woorise. When you plan to run your Instagram contest the first thing to consider is where you want to host your contest. Although we are talking about Instagram giveaways you have two options where you can host your Instagram giveaway or contest. One option is to host the giveaway on your Instagram account as an Instagram post and the alternative way is to host the giveaway outside of your Instagram account for example on your website or blog, on a landing page etc. Both options have pros and cons. This is the simplest way but it’s coming with limitations. One of the biggest limitation is that you can’t collect user emails or other contact details which you could take advantage of it later on your marketing campaigns. Another downside is that Instagram doesn’t allow to have links in Instagram posts or options for sharing the post. Beside these choosing to host your giveaway in your Instagram account is easy and you can get a high number of comments, likes and increase engagement. It is important to establish and emphasize what it takes for your audience to enter the Instagram contest, therefore clearly outlining the entry requirements in your post. There are several ways to get followers to participate in your giveaways and increase your follower growth. However the less you ask people to do, the more entries you’ll get. Getting people to take some sort of action such as posting a picture and tagging your brand will generate more engagement and build your following. Choose between different contest types and feel free to get creative! To maximize your contest results combine two or more from the above contest types. The beauty of Instagram is that it doesn’t have as many promotion limitations as other platforms. That means you have the opportunity to be as creative with your contest concept as you’d like. This option is more powerful because you have more control on your giveaway. The only downside is that you need to take your audience outside of Instagram. Many users are feel more comfortable and familiar on Instagram. Also Instagram make it harder to drive users outside of the platform with not allowing link in posts (check the secret tips on the bottom of the article for a solution on this). Where to host or what type of contest should I choose? If you consider where to host your giveaway we recommended to take advantage of both options for the best results. First create your giveaway using a contest app like Woorise and then create an Instagram post to inform your users about the giveaway. In the Instagram post ask for any of the entry contests types above. For example you can ask your audience to follow you, leave a comment and then visit your contest’s landing page. Start by setting out achievable goals so you have something to work towards. Do you want to get more followers? Build brand awareness or create brand loyalty? Do you want a specific number of mentions or a certain amount of user-submitted content? The more specific you are with your objectives, the more likely you’ll see positive results. Marketing is all about telling your brand’s story, and Instagram is the perfect tool to help you do that. Whether it’s increasing your followers by 50% or gaining 100 leads, you need to set out credible goals so you can measure how successful your campaign has been, once it’s over. Don’t forget to set a time frame and budget for your contest, as determining these details upfront will help you design a more effective contest. The best duration to run your Instagram contest is between 20 – 60 days. Most Instagram giveaways have instructions to either like the post or tag friends in order to enter the giveaway. You can be more creative and get inspired from what other Instagram marketers are doing, then applying the most successful techniques to your marketing campaigns. There are a lot of ways to find Instagram competitions, prize draws and contests. Search for hashtags on Instagram – try contest related hashtags like #giveaway, #competition, #contest, #win etc. Search for giveaways, contests and competitions on Google – try various keywords and phrases like win Instagram contests, Instagram giveaways etc. The contest prize is one of the most important factors to generate better results. Focus on giving away prizes that are relevant to your target audience, related to your brand, or at least your industry. Generic prizes tend to attract freebie seekers who aren’t interested in your company or products, and just want to get something for free. Giving away a “big” prize, like an iPhone or cash might bring you lots of entries and followers, and even engagement but if your goal is to build a solid customer base, you’re better off designing your Instagram giveaway around a prize that’s relevant to your business. Prizes worth $1,000 or more generally achieve bigger engagements compare with prizes that worth $99 or less. If you want to give away a high-value prize, but you don’t have the funds to invest in one, consider a partnership with another brand. By picking the right prizes, you can reliably attract the right kinds of followers and generate brand awareness among the best demographic for your business. This is one of the most enjoyable ways to get more Instagram followers and engagement. Choose a business with a similar customer base as yours and partner up for an Instagram contest. Partnered promotions are an awesome way to co-market to two audiences with similar interests. This allows to populate followings with people from each others’ existing follower bases. Just take a look around Instagram and find people whose sensibilities mesh with your own. Then take the time to reach out to them and develop a partnership. You may already have a business or influencer in mind that you want to reach out to, but it doesn’t hurt to do some research on prospective sponsors. To help you even more here are some great tips to find instagram influencers for your business from later.com. Another type of partnership is sponsors. Bringing on a sponsor or co-sponsor for the contest will help expand your visibility. It also can help you build powerful relationships with industry peers and influencers. When searching for a sponsor for your Instagram contest, be sure to choose someone relevant to your audience and who can benefit from the contest just as much as you can. An effective Instagram contest needs clear ground rules. You want to be clear about the eligibility of entrants. Should contestants be a part of a certain age group? Is the contest only open for individuals in a specific state or country? Post the rules to avoid any confusion or potential issues when winners are selected. Also don’t forget to check out Instagram’s Promotion guidelines and make sure to comply with their rules. When running an Instagram photo contest, you need to create an exclusive hashtag for it. Hashtags are super important because they help you keep track of your entries. They can also highlight your brand, campaign or product. Ask people to post photos and require they use your hashtag. Then you just search for the hashtag and choose the winner. Hashtags aren’t just for tracking entries. They also help boost the exposure of your content to the most relevant people for your brand. The right combination of hashtags will give your contest the exposure it needs to succeed. You can also try to use your contest’s related hashtags along with other Instagram popular hashtags it will make your contest even more powerful. Once you have a plan in place it’s time to think of a promotion strategy. Clearly, you want to bring more exposure to your contest. This is the most important part of all because no one will enter your Instagram contest unless they know about it. To capture more followers and generate more submissions when sharing the photo contest on your Instagram account, try to use a high-quality and catchy image. Adding the word “Giveaway”, “Contest”, “Competition” or the actual contest hashtag into your image may also help. Ads – Create an ad and advertise your contest to popular advertising platforms like Google Ads, Facebook Ads, Reddit Ads etc. Finally, it’s time to pick a winner. Figuring out your winner will depend on the type and the rules you decided were best for your giveaway. Keep your terms and conditions in mind when reviewing the submissions to ensure that you’re being 100% fair in your evaluation. If you used an app like Woorise to run your Instagram contest picking the winner or winners is as easy as a click of a button. Most contests apps have options to easily pick winners but if you hosting your contest on Instagram asking for likes, comments etc. you need to pick the winners manually or to use an external tool to draw winners. To reach the winner, you can either connect via Instagram’s direct message feature or post an image announcing the winner and ask them to get in touch with you. Again if you use an app like Woorise to create your giveaway you can contact the winner direct via email. Once you’ve notified the grand-prize winner, consider how to make everyone else a winner, too. Email all entrants to thank them for taking the time to fill out your form, and give them a special reward. It doesn’t have to be a physical prize. Even a special discount or coupon to all those who enter will be seen as good will from your brand. If you hosted your giveaway on Instagram and you didn’t collect any emails announce the winner and promote their winning entry with a post on Instagram. Once the contest is complete and you’ve notified the winner, it’s time to measure the success of your campaign. Did you reach the goals that you made? Like-to-win contest: Did the competition post become one of your most liked Instagram photos? Comment-to-win: Has the giveaway post become one of your most commented on posts? Did it get more comments than your previous giveaways? Follow-to-win: Has your Instagram follower ratio grown? The more followers you acquire, the greater this figure will become. Use the data that you’ve gained from your contest to your advantage. Write a blog post about the winner and include their photo; send an email to all who took part; and keep engaging with your new followers! Now it’s time to think about running your next giveaway. You’ll find more success in your next giveaway if you think about what parameters of your next giveaway can be changed to improve its performance. Each time you run an Instagram contest, you learn a little bit more about your followers, as well as what motivates them to engage with you and share your contest. Use this information to fine-tune your efforts for the next time you run a contest. Okey this is not a secret but a lot of brands ignore how powerful it is and how helpful can be to encourage engagement. Asking questions or calling for an action is one of the fun ways to encourage your followers to interact with your Instagram posts. The simple act of requesting that your audience comment or inviting them to engage can go a very long way when it comes to boosting your Instagram engagement. While engagement has always been important, and a focus area for all, I believe there is now some added benefit to having a highly engaged audience on Instagram. Great engagement can push you out into the algorithmic feed, as well as help you reach the top posts area for any of your given hashtags. Engagement is important and luckily, it is somewhat within your control. Not only for giveaways but every post should invite engagement by including some kind of question, invitation for discussion or call to action. It’s great way to inspire your followers to engage with your account in the comments section and spend more time viewing your post. Vote for your favorite: A or B! Want to check yourself what you missing if not using call to actions in your Instagram contests? Check the following two Instagram giveaways that we run using Woorise app. In the first one we haven’t any call to action at all. In the second we ask people to follow some steps and take actions. Although the giveaway prize is not the same, you can compare the huge difference for Likes and Comments for each one. On Instagram, the places where you can include clickable links are limited because Instagram wants to prevent spam on the platform. One of the few places where you can put a clickable link on Instagram is in your profile description. This is also known as your bio. As you know, individual Instagram posts don’t allow for links. Sure, you can enter the link within your caption but once that photo is actually posted, the link will just appear as text. When you host your contest outside of Instagram using a contest app like Woorise the link in bio it’s the one place where you can get followers directly to your Instagram contest. Note: Don’t forget to replace the link when the Instagram giveaway ends. Instagram does not allow users to upload photos or videos to their profile from the desktop site. This is an intentional move from Instagram to encourage mobile use of the app. However, for many photographers, influencers and businesses whose content is likely to have been taken on a camera, created on Photoshop or Canva the task of sending everything from desktop to phone to post manually can be very time-consuming! Wondering how to post to Instagram from PC or Mac? Actually there is a simple way to post to Instagram from PC or Mac. It requires no third-party site or download, and is completely free, however, the method is very basic and does not work with video files. Most browsers have a way of letting you change the “User Agent” — the thing that tells a website what kind of device you’re on. So, even when you’re on a laptop or desktop, you can trick a website like Instagram into showing you the mobile site. That’s what we’re going to do. When done correctly, your Instagram contest can be much more than a way for people to get free stuff. It can be an effective marketing tool to grow your brand and build a strong community on Instagram. The statistics show that Instagram works, while they also show that Instagram contests are one of the most effective strategies for increasing engagement. 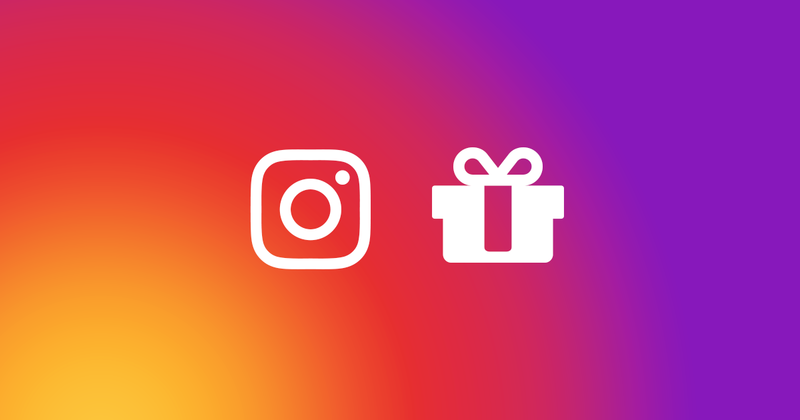 No matter what kind of business you’re in, Instagram giveaways are an excellent way of reaching new prospective fans with your products or services, growing your social following, and engaging with your fans. You can start with a small contest and get your bearings, then once you’ve figured out the logistics of it, you can scale up your efforts and run more intricate contests that get people truly excited. From the simple to the elaborate, there are various ways to set up an Instagram giveaway. And because they’re easy to manage, you can experiment with a few different types of contests with smaller prizes to figure out what your audience responds to. When you find the winning formula, kick it up a notch with more valuable prizes and mix and match the requirements to maximize engagement. Obviously some kinds of businesses will be better suited to Instagram giveaways and promotions more than others, but hopefully, this post has given you some ideas for things to try during your next – or first – Instagram giveaway. Get at me in the comments with ideas, suggestions, and tips of your own for running an Instagram giveaway.